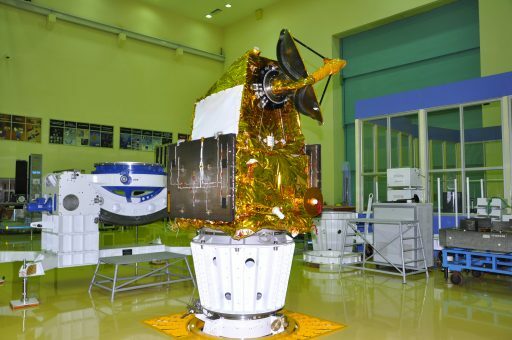 SCATSat-1, Scatterometer Satellite 1, is an Indian ocean and wind monitoring mission operated by the Indian Space Research Organization as a gap-filler between the OceanSat-2 and 3 missions to provide data continuity in global ocean wind measurements. Measurements of ocean surface winds are critical for weather forecasting as evident in an international cooperation for the exchange of this vital ingredient for weather forecasting models. OceanSat-2 was launched in 2009 and delivered excellent ocean surface wind retrievals using its Scanning Scatterometer known as OSCAT. 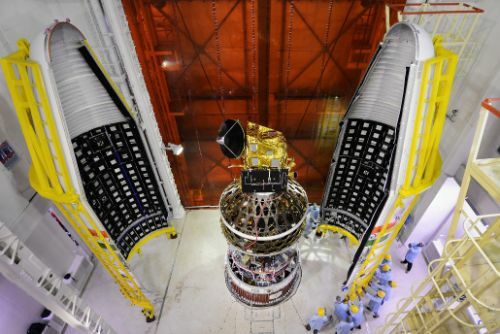 In 2014, OSCAT suffered a problem in its amplification system as had been expected per the satellite’s 4.5-year service life. 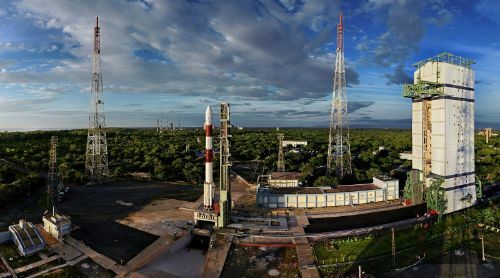 To bridge a gap until the multi-instrument OceanSat-3 spacecraft is ready for launch in 2018, ISRO put into work a low-cost interim mission. 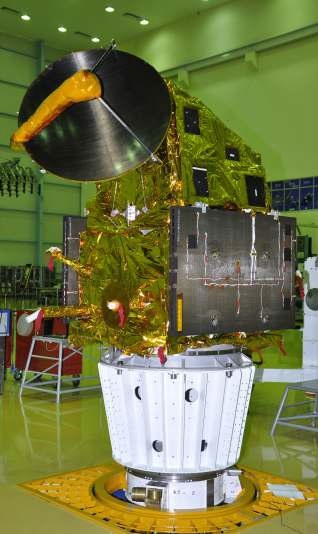 SCATSat-1 makes use of the Indian Mini Satellite 2 platform (IMS-2) and weighs 371 Kilograms at liftoff. The satellite was assembled in just over a year, built from spares of previous missions to support an accelerated development timeline. The IMS-2 satellite bus offers complete redundancy within its critical subsystems and follows a modular design approach, allowing the satellite platform and instrument to be developed and tested separately before being joined late in the satellite integration process. 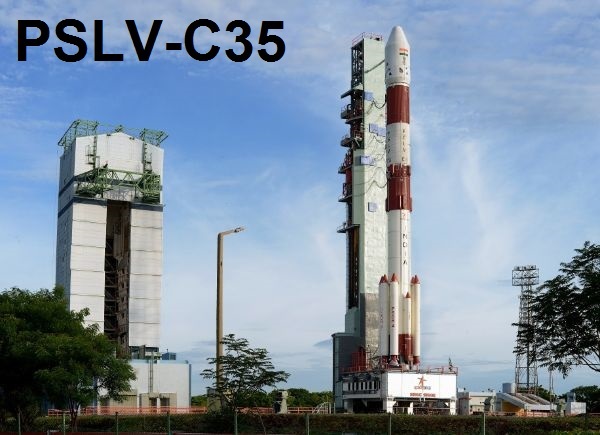 The satellite hosts a pair of two-panel solar arrays that generate a power output of around 750 Watts and feed dedicated power electronics, relay packages and DC converters to distribute a 28-33-Volt power bus across the satellite from a 28 Amp-hour Li-Ion battery. The baseline IMS-2 design calls for attitude control using a combination of 5Nms reaction wheels and magnetic torquers which come into play when unloading the wheels and during spacecraft safe mode. Attitude data for fine-pointing is provided by a Star Tracker while magnetometers provide data for torquer actuation, sun sensors point the arrays for power generation in safe mode and an Inertial Reference Unit measures body rates and acceleration. The typical IMS-2 design comes with a Hydrazine monopropellant system featuring eight 1-Newton thrusters fed from a 21-Kilogram tank. Internal data systems on the satellite support analog command and housekeeping telemetry exchange and a 1553 data bus between the onboard computer and the payload for commanding and feed back. The payload module interfaces with the spacecraft’s 32GB memory unit via LVDS. Communications are handled in S-Band for command uplink and telemetry downlink while payload data is transmitted to the ground using a high-speed X-Band terminal achieving data rates up to 105Mbit/s. The primary payload of the SCATSat-1 spacecraft is OSCAT-2 – an advanced version of the original OceanSat Scatterometer featuring improvements to the hardware and onboard signal processor and control software based on previous flight experience. OSCAT-2 is a pencil-beam wind scatterometer – using a two-beam design with an inner and outer beam arranged to keep the incidence angles constant and allowing measurements to be made at multiple azimuth angles (up to four). The inner beam is angled 42.6° off the spacecraft nadir while the outer beam has a 49.3-degree angle to the nadir axis. The instrument uses a conical scan geometry, rotating a 1.0-meter diameter reflector at 20.5rpm. This means that the two beams sweep out a circle around the instrument nadir vector with a diameter driven by the operational altitude of the satellite. The two beams have a divergence of around 1.4 by 1.65 degrees. 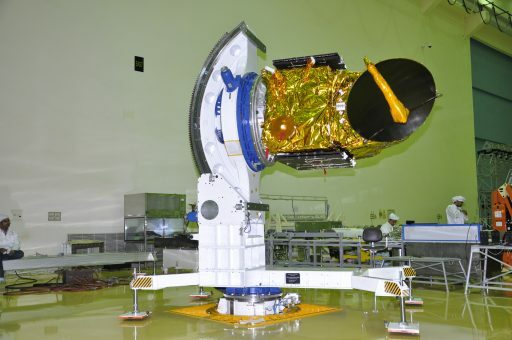 From the planned 723-Kilometer orbit of SCATSat-1, the instrument covers a 1,400-Kilometer swath with the inner beam that uses Horizontal Polarization and 1,840 Kilometers with the outer beam employing Vertical Polarization. The scanning geometry has been chosen to allow the instrument to view each point on Earth that is within the beams four times as the instrument passes over (twice by the inner beam looking forward and then aft, and twice by the outer beam also looking forward and then aft as the spacecraft passes over). The instrument transmits microwave pulses at a frequency of 13.515 GHz (Ku-Band) and records the incoming echo signals. 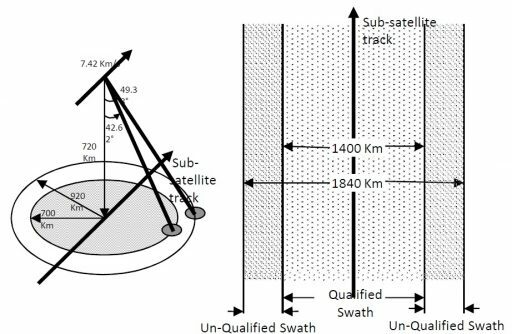 An optical angle encoder is employed to monitor the antenna azimuth position with respect to the orbit pitch axis, information that is important for real-time data processing that compensates for the Doppler component in the return echo. Scan motor and dual channel rotary joint are facilitated within a single scan mechanism housing with the joint responsible for routing of the transmit and receive RF signals to the two horns. The OSCAT-2 instrument is comprised of a Digital and RF package that includes the Digital Subsystem, Frequency Generator, amplifiers and receiver package; the antenna system with San Mechanism; and the interface unit with Front End Switch Assembly and crosspatch switches. The Frequency Generator is in charge of delivering local oscillator signals, modulated transmit signals and clock signals for operation of the digital system. A Temperature Compensated Crystal Oscillator operating at 50MHz builds the heart of the RF system. Overall, OSCAT can register surface winds between 3 and 30 meters per second with an accuracy better than 1.8 meters. Wind direction is measured with an accuracy of 20 degrees and the resolution for wind vector cells is 25 by 25 Kilometers. 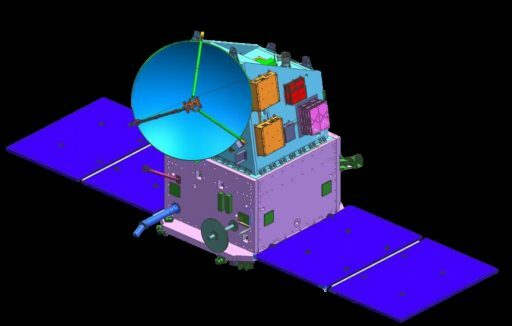 SCATSat-1 operates from a Sun Synchronous Orbit 723 Kilometers in altitude, inclined 97.4° with a Local Time on Ascending Node at 6:00.